I recently found myself back in Chicago with high hopes for some culinary adventures. I revisited the delicious GT Oyster and Fish, which did not disappoint, ate some tasty Asian buns at Wow Boa, and had my first highly satisfying taste of deep-dish pizza at Lou Malnati’s. One of the highlights of my visit was a day trip that I scheduled, specifically for my sweeter side, to the Jelly Belly Visitor Center in Pleasant Prairie, Wisconsin. It's located about an hour's drive north of Chicago, just over the Illinois border. It is also one of the many factory tours listed on my U.S. candy factory tour map that I mentioned in my last blog post. 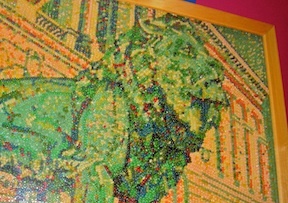 I have been very fond of Jelly Belly jelly beans ever since I first learned about them in high school. These beans are extra fun to snack on thanks to an endless variety of flavors and colors. My personal Jelly Belly favorites are watermelon and toasted marshmallow. The visitor center in Pleasant Prairie includes a kid-friendly train ride around the Jelly Belly warehouse and a series of digital movie shorts explaining the company history and the jelly bean creation process. 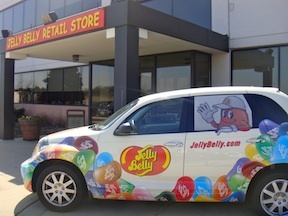 There are plenty of yummy beans to go around and visitors can take a trip to the Jelly Belly sample bar after the tour. It is important to note however that this is not a working factory where the beans are produced like at the Fairfield, CA location. Instead it’s more of a fun learning and tasting center, which was perfect for me! 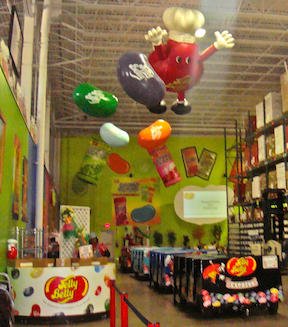 I learned some little known and interesting Jelly Belly facts from my tour. 3) While many people would love to have a flavor created especially for them, this actually did happen in 1981 when the Blueberry flavored bean was invented. It was created in honor of President Ronald Reagan so that a patriotic combination of red, white, and blue beans could be served at his inauguration. So, if you ever find yourself in the Chicago area and looking for something sweet eat, head to the Jelly Belly visitor center!